That is a commonly played out scenario off of Sarasota beaches from May through July. 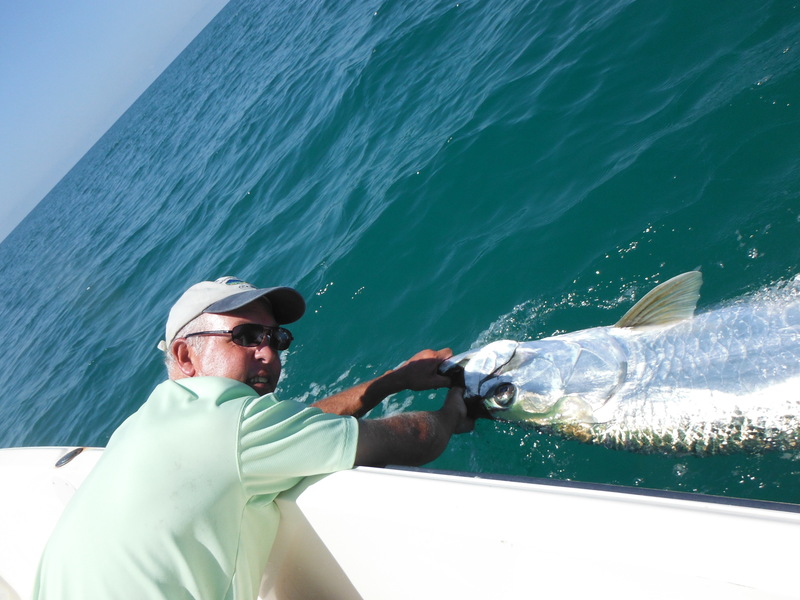 While fishing is very good all year long, there is something magical about tarpon fishing in Sarasota. This is truly world class angling. Very few places on Earth offer the opportunity to sight cast to fish this large using spinning or fly tackle. Many more tarpon are hooked than are actually landed. 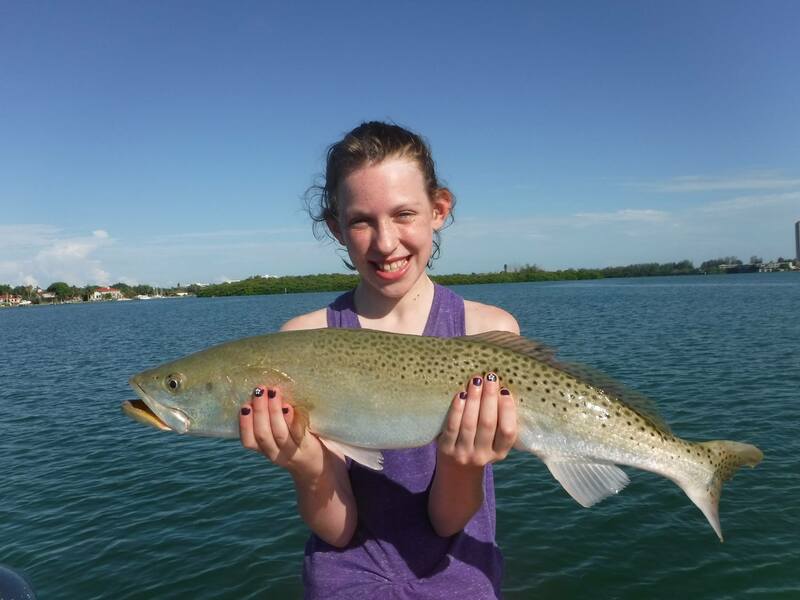 In fact, most Sarasota guides put more emphasis on stalking and hooking these behemoths than in actually landing them. The old saying, “It is the bite, not the fight” certainly applies. The tarpon fishing in Sarasota technique is pretty straightforward. Get out on the beach before first light and sit a hundred yards or so from shore. Sit patiently while scanning the surface for fish. Most schools will be moving south but a few will be moving north, especially later in the season. Once a school is sighted, an electric trolling motor is used to position the boat so that it intercepts the fish. The best position would be a long cast up-wind. The baits are cast out in front of the fish and hopefully a hook-up ensues. 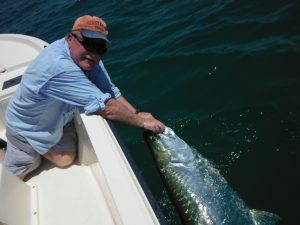 Anglers in larger boats can catch tarpon, but it is more difficult as they must anticipate where the fish might be and drift in front of them. Heavy spinning tackle spooled with 25-30 pound line is the best choice for most anglers. Although the fish are very large, the baits are light. Conventional outfits can be used to drift baits out behind the boat but are not very practical for casting. The rig is pretty basic; double six feet of the running line using a Spider Hitch or Bimini Twist, then add 3 feet of 80 lb leader using a Double Uni-Knot. Tie on a 5/0 live bait hook and the rig is complete. Both “J” hooks and circle hooks are used. Live blue crabs are by far the preferred bait. A 3” crab is perfect and is hooked on the outer edges of the “point”. Live bait fish such as pinfish, sardines, cigar minnows, threadfin herring, and blue runners are also productive and can be caught using a Sabiki rig. Patience is required when tarpon fishing in Sarasota. It is very easy to get excited and overly aggressive. The angler who takes the time to get into perfect position will score more often than the impatient one who runs around. A couple words regarding etiquette; do NOT run an outboard near a school of tarpon! It is better to let them go, motor around and reposition than to fire up the “big motor” in a school of fish. Also, if another boat is working a school, leave them to it unless they wave you in. This is especially true in regards to fly fishing, give those guys plenty of room to work.